Photo/Anthony Victoria The old Tela Railroad Company headquarters, where my grandfather Luis Midence Cerrato worked. I stood in front of the vibrant blue coast in Tela Atlantida, Honduras in early October, thinking about the tribulations my ancestors had to endure at the hands of their own government. Earlier that day as I walked with my mom’s childhood best friend Carlos, we encountered the vacated Tela Railroad Company building. I asked him a question about the structure and its significance. Carlos responded by explaining that one name always stands out to many locals—Luis Midence Cerrato—my grandfather (deceased as of 2005). I never met him, but the reputation he has in the small Caribbean town was earned because of his firm demeanor as a labor organizer in the 1950s and 60s. He was an employee of the Tela Railroad Company, one of several United Fruit Company subsidiaries in Honduras. My grandfather, Don Luis Midence Cerrato. He was a union organizer in Tela, Honduras during the 1950s and 1960s. 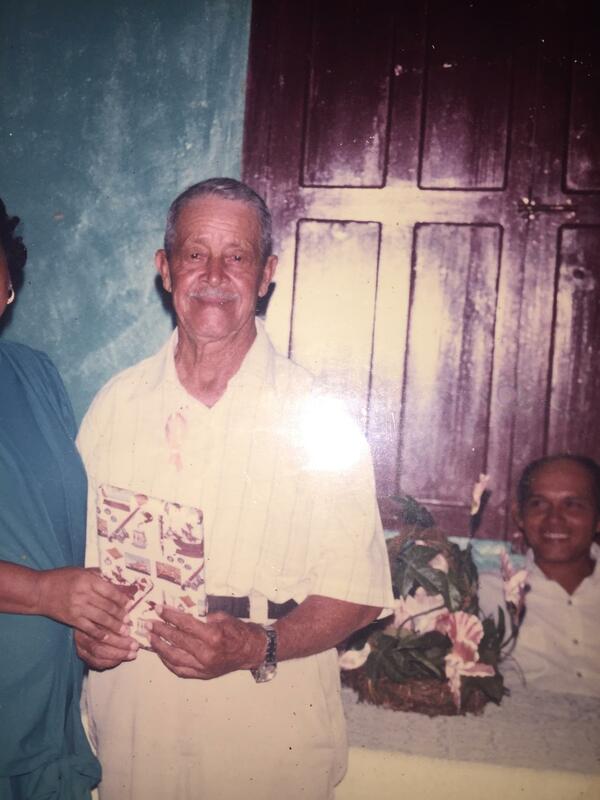 My grandfather, like many other workers, became frustrated with the coercive working conditions exercised by the oppressive Honduran regime that defended the interests of U.S. fruit companies—rather than put first the issues and concerns of their constituents. As a result of his willingness to criticize the government for allowing such exploitation to take place, rumor has it he was tortured for days by the military for his role in denouncing the leadership. In fact, my mother says my grandfather allegedly cradled her from a jail cell as he awaited trial sometime in 1963. As my first visit to Tela prolonged, I noticed the harsh economic conditions the majority of the residents endure. In receiving feedback from the locals, I found that a large number of employees make under $1/an hour and work in the tourism industry (hotels, restaurants, resorts, etc.) that cater mainly to American visitors. And while “La Frutera” (what the United Fruit Company is known as in Latin America) no longer has its operations in Tela, it has left behind several legacies, one of which is economic depravation. While there are several factors that have contributed to the instability that exists in Honduras today, a recent case study conducted by the AFL-CIO has pointed to economic exploitation as a factor to government impunity. The labor union believes U.S. transnational corporations have contributed to the commercial exploitation and political intimidation that continues to take place across the country. Currently the Dominican Republic–Central American Free Trade Agreement (CAFTA-DR) is being promoted as a benefit to U.S. trade. Perhaps bilateral trade has boomed in recent years, but it doesn’t come without a social or economic expense for the locals. The AFL-CIO report indicated that the free market has allowed for 70-percent of transnational employers to violate minimum wage and overtime standards. “Workers and community leaders spoke not only about the extreme levels of corruption, but also the increased militarization of the country, and widespread corruption among security forces,” reads the report. Furthermore, the report also points out that U.S. aid for purposes of security has increased to about $27 million in recent years. Perhaps that helps explain why one could turn in every direction and have close sight of military personnel, equipped with state of the art weaponry. It’s obvious that people in Honduras have fear in speaking out because doing so could result in serious bodily harm or death. So why are we facing the issue of the influx of Central American immigrants? Because as leaders of the Free World, we continue to forego pressuring Central American governments, such as Honduras’, to sustain and harbor civil and labor rights. Until that issue is solved, the U.S. will continue to feel the burden of the immigration influx. “Los Yankees son imperialistas (The Americans are imperialists),” she mimicked him. I think there’s truth to that. But I am also optimistic in believing that we could live up to our billing as “protectors of Democracy” by providing solutions. Our leaders can start by aiding refugees fleeing political violence, granting asylum, and preventing deportations. To do so, leaders in both Central America and the U.S. need to demand accountability. Let’s stop stigmatizing our southern neighbors. For once, let’s look at the root of the problem and understand why they come here.